Get ready to meet the team of data scientists behind HPE InfoSight. And learn how we’re leveraging this AI-driven analytics platform to improve the customer, support, and sales experience. In 2012, InfoSight was launched with the intention of leveraging telemetry data to identify, predict, and solve customer issues with storage arrays. This in turn would allow our support team to consist primarily of Level 3 engineers. The bold vision was put in place by our Chief Data Scientist at the time. In the early days of Nimble Storage, the data science team knew data would be valuable and had the foresight to begin collecting DNA about the hardware being deployed in the field. InfoSight enabled the team to leverage multiple years of detailed performance data pertaining to hard drives, solid state drives, fans, CPUs, power supplies, and network cards. This trove of data became the backbone of InfoSight and the data science team. In the years since the launch of InfoSIght, the data science team has played an integral role in differentiating our storage arrays from our competitors. Leveraging installed base data allowed the team to programmatically open, remediate, and close cases on our customers’ behalf. As the scope of data increased, the data science team has been able to create more sophisticated models and tools that not only enhance the customer experience but also the support and sales experiences too. Additionally, the data used by the data science team has expanded into the stack leveraging sensor data and configuration data from virtual machines connected to the various HPE platform. InfoSight data science has been providing customers with the ability to view capacity and performance predictions based on specific workloads allowing them to avoid troublesome situations that could lead to poor performance. Various resource models have been created to help a customer identify periods of saturation, cache latency, and CPU usage. Configuration data also plays an important role in the analytics provided to customers. Individual volumes can also become problematic so we closely monitor overprovisioning on the customer array. When analyzing all the data for a particular customer we are able to confidently use our models based on real-world data to make recommendations to our customers on upgrade needs to ensure they continue receiving the performance they expect from our hardware. The InfoSight data science team has worked closely with our support organization since the beginning to provide insights into the install base performance of similar customer configurations. The team partners with support to help create signatures that are used for proactive case monitoring. As we feed our support data into our data lake we are able to look for similar patterns across various models of hardware or software releases to refine rules that are currently in place. InfoSight has also been a key tool in the support investigation process. It allows a customer to gain insights into the operation of their HPE equipment while viewing the same information a technical support engineer will see. The team has created tools which are used in the sales cycle to help right-size a customer environment leveraging our real-world installed base knowledge. These sizing models are sophisticated in nature and take into account known performance metrics, sensor data, and latency. They allow users to input various criteria that matters to the customer and weigh cost versu performance—while providing recommendations that are based not just on marketing data but on known performance for particular workloads, array models, or disk types. Historically. we have also been able to leverage our recommendation engine to generate leads and opportunities the allow the sales team to help serve our customers. The HPE InfoSight data science team has a wide breadth of experience, ranging from recent grads to 20+ years. The team has received multiple patents for the work in the data space. The data scientists work closely with our dedicated data engineers, support team, and product specialists. In the coming weeks you can check this space for blogs written by the individual data scientists discussing the technology stack, research approach, real-world findings, and formula usage. I am Marketing Manager for HPE InfoSight. Before that, I led the marketing for the deep learning startup, Nervana Systems, up until its acquisition by Intel in 2016. Discover how a joint data storage solution from HPE and Cohesity eliminates secondary storage silos and restores sanity to application chaos. Without question, secondary storage has become a critical issue for IT decision makers. A previous blog discusses how disjointed secondary storage can cause mass data fragmentation, which can slow down the business and potentially raise compliance risk. It's clear that secondary storage has become a primary problem. What's needed is a solution that can eliminate the need for so many of these silos. Now, via a partnership between two enterprise IT firms—HPE and Cohesity, iPhone-like simplicity has come to handily solve the secondary storage dilemma, bringing with it some incredible outcomes. This solution: HPE Solutions for Cohesity DataPlaltform. Cohesity, a market-leading purveyor of a hyperconverged secondary storage software stack, provides software that runs atop HPE Apollo and ProLiant servers. This combination handily solves the mass data fragmentation problem. With Cohesity, your data is no longer massively siloed, copies of data are reduced or eliminated, and you reduce or halt the spread of data to every corner of your organization. Why is this so important? In research performed by VansonBourne, 98 percent of respondents indicated that their secondary storage needs will grow in the next 18 months, with more than one-half saying that their storage needs will grow between 25 and 75 percent per year. Fixing this without the right tools isn't easy. In fact, 26 percent of respondents said that they would rather quit their jobs than be tasked with fixing their company's secondary storage problems without the right tools in place. You may be wondering how this HPE/Cohesity mashup can help you solve the storage growth issue, since you'll still have a lot of data to contend with. What Cohesity brings to the picture is a software solution that conglomerates all of an organization's secondary storage assets under one managed umbrella, instantly imbuing visibility into what used to be something of a black box. Where the real magic comes in, however, is through Cohesity's global deduplication, compression, and erasure coding features. These capabilities allow organizations to grow in a far more sustainable way than they can with a smattering of point solutions. This transition to a converged secondary storage architecture can't happen soon enough. Today, 48 percent of survey respondents say that their secondary storage sprawl means that their IT team spends 30-to-100 percent of their time cleaning up. Almost all respondents—98 percent—say that it's getting worse. Data protection capabilities for workloads that operate in the secondary arena. Full support for object file types. No longer do you need a separate solution to manage object-centric application needs. Cohesity can handle that for you as a part of its integrated software. Test/dev support. For many, test and development environments were just fragments sitting on their own. With Cohesity, all of your test and dev activities can be managed via the integrated platform and then easily promoted into production once you're ready. This provides a seamless DevOps experience for your organization. Data indexing so that you always know what you have and where you have it. Encryption of your data both at rest and in flight. If you're looking for a solution that's hyperconverged onto a single platform, the joint HPE and Cohesity solution is exactly what the CIO ordered. You can collapse a number of previously disparate secondary-centric services into one. And it's not limited to an on-premises approach. The HPE Solutions for Cohesity DataPlatfrom also helps you accelerate your hybrid cloud journey. The Cohesity software optionally leverages the public cloud for myriad purposes, including as a backup target, a target for long-term data retention and archive, a storage tier, disaster recovery, and test/dev purposes. All of the features described earlier, including data reduction, global indexing, and security, apply to the public cloud side of the Cohesity equation, too. The result is a seamless experience between your HPE-driven on-premises Cohesity solution and your favorite public cloud, whether that's AWS, Azure, Google, or another Cohesity cloud partner. With great software comes a need for great hardware from a trusted partner. Cohesity is a hyperconverged solution, meaning that the underlying hardware needs to work in concert with the solution—not as a hindrance. Even with a conglomeration of secondary data sources, secondary storage needs will still grow, and these data sources have and will continue to have importance to the organization. The only way that such a solution works is if it's running on hardware that is stable, fast, easily managed, and scalable. HPE brings that in spades with HPE Solutions for Cohesity DataPlatfrom. A solution is only as good as the support behind it. The HPE and Cohesity solution is a full member of HPE's global supply chain, helping customers around the world reduce deployment risk and complexity and unlocking a fully optimized deployment and support experience. For those that are uncomfortable taking the plunge on their own, the HPE and Cohesity solution can be configured and deployed by HPE Pointnextconsulting services. As you consider your secondary application needs, look no further than the hyperconverged secondary storage solution from HPE and Cohesity to allow you to simplify your environment by conglomerating workloads into a single, scalable hybrid environment. 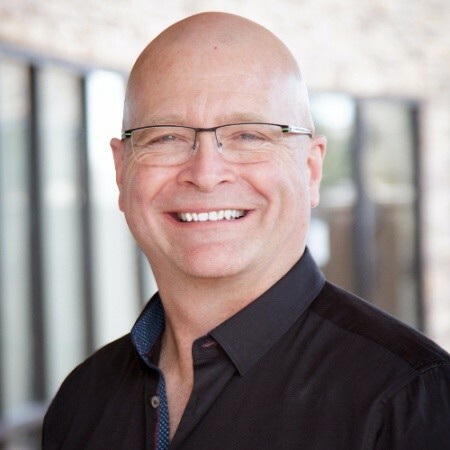 Meet Around the Storage Block blogger Scott D. Lowe, CEO and Lead Analyst for ActualTech Media. Since 1994, Scott has helped organizations of all stripes solve critical technology challenges. He has served in a variety of technical roles, spent ten years as a CIO, and has spent another ten as a strategic IT consultant in higher education. Today, his company helps educate IT pros and decision makers and brings IT consumers together with the right enterprise IT solutions to help them propel their businesses forward. Organizations everywhere are on a hybrid cloud expedition. One that can be complex but one that we, at HPE, aim to simplify no matter which path our customers choose. In recent years, we’ve taken many steps to accelerate customers’ hybrid cloud journeys. We’ve simplified our own organizational structure, creating a Hybrid IT business group that is integrated and easier for customers to navigate – because all infrastructure, software, and services capabilities are under one roof. Plus, we have made extensive additions to our suite of products and services in order to give customers the choice and flexibility they crave for a consistent and optimal experience across public and private clouds. One of those is HPE SimpliVity, a key component of our Composable Cloud portfolio which enables customers to streamline IT operations with a fast, uncomplicated and efficient hyperconverged infrastructure (HCI) platform – and at a fraction of the cost. And today, we’re further expanding our commitment to deliver the options and the experiences our customers desire for hybrid cloud by strategically aligning with two powerful industry players. Each is designed to extend our fast-growing and ever-evolving HPE GreenLake ecosystem. To extend the HPE Composable Cloud portfolio, HPE and Google Cloud have entered into a strategic partnership to deliver hybrid cloud solutions that accelerate innovation and expand choice and agility for customers. 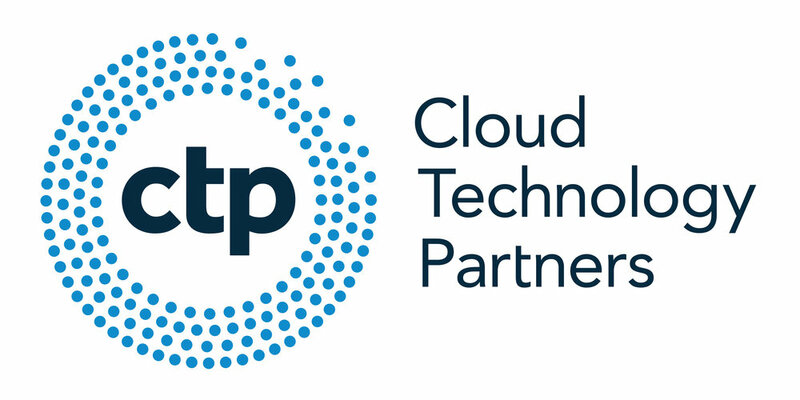 The partnership will provide customers with a consistent experience across public cloud and on premises environments. As an initial part of this strategic agreement, HPE will offer two validated designs for Google Kubernetes Engine (GKE) based on HPE SimpliVity hyperconverged offering and HPE Nimble Storage with HPE ProLiant offering. In addition, HPE will offer these solutions as a service through HPE GreenLake, HPE’s fully managed consumption offering. Customers that choose this offering can run applications as a Service in the Google Kubernetes Engine environment on premises and benefit from the same container-based design across their hybrid cloud. In addition to that, we are partnering with Nutanix to deliver an integrated hybrid cloud as-a-service solution. 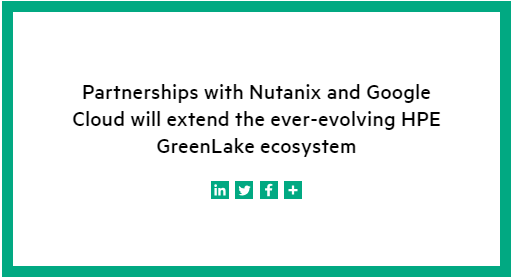 The offer -- which leverages Nutanix’s Enterprise Cloud OS delivered through the HPE GreenLake as-a-service solution – will provide customers with a fully HPE-managed hybrid cloud. As part of the agreement, Nutanix is also expanding platform choice to its customers and will enable its channel partners to directly sell HPE ProLiant DX and HPE Apollo DX servers combined with Nutanix’s Enterprise Cloud OS software, so that customers can purchase an integrated, turnkey appliance with built-in intelligence and security. We believe our offering with Nutanix is an attractive choice that will reduce cost and complexity by offering a fully managed hybrid cloud infrastructure delivered as-a-service, to be deployed in customer data centers or in a customer’s co-location facility. With tools like these, customers have the wherewithal to build hybrid and private clouds and transform their existing applications. They can provision workloads of all types, across virtualization, containers and bare metal, in minutes. And as a result, they will spend less time managing infrastructure and more time creating value-added services at a fraction of past operational costs. Some might ask why we are pursuing such unique and collaborative offerings with other providers. But to me, the reason is obvious: For certain customers, in certain situations, we can offer stronger composable solutions, together. It’s all about delivering what the customer wants and needs, and we don’t mind sharing – while still continuing to compete vigorously across our entire portfolio of solutions. The transformation to hybrid cloud can be difficult and confusing. With bold, customer-centric, and simplified initiatives – such as today’s two groundbreaking announcements with Google and Nutanix – HPE further strengthens our position as the strategic hybrid cloud transformation partner for any enterprise. And in doing so, the pathway to hybrid cloud just became a lot easier to travel. Learn how a circular economy mindset both improves sustainability as a benefit to individual companies as well as the overall environment. Listen to this podcast discussion on how workers in harsh conditions are gaining ease in accessing and interacting with the best intelligence thanks to a cloud-enabled, hands-free, voice-activated, and multimedia wearable computer from HPE MyRoom and RealWear. Learn why changes in cloud deployment models are forcing a rethinking of IT economics, and maybe even the very nature of acquiring and cost-optimizing digital business services. A discussion on how a Canadian maker of containers leverages the Internet of Things to create a positive cycle of insights and applied learning. Learn from an IT industry analyst about the forces reshaping the consumption of hybrid cloud services and why the model around procurement must be accompanied by an updated organizational approach. A discussion on how new maturity in management over all facets of IT amounts to a culmination of 30 years of IT operations improvement and ushers in an era of comprehensive automation, orchestration, and AIOps. Read how digital transformation for HCM provider ADP unlocks new business insights from vast data resources using big data analytics and artificial intelligence strategies. In this episode of Fairygodboss Radio, Romy sits down with Jill to talk about career growth and the importance of getting outside of your comfort zone. Jill Sweeney leads technical Knowledge Management for volume servers, high performance computing and artificial intelligence, and composable systems at Hewlett-Packard Enterprise (HPE). She and her team are transforming the technical experiences customers and partners have with HPE's products, solutions, and support information to foster positive customer business outcomes. A discussion on how a massive corporate split led to the re-architecting and modernizing of IT to allow for the right data center choices at the right price over time. Christiansen: Cloud is a completely different modality, Dana. One of the things that we have learned here is that adoption of infrastructure that can be built from the ground-up using software is a whole other way of thinking that has never really been the core bread-and-butter of an infrastructure or a central IT team. So, the thinking and the process -- the ability to change things on the fly from an infrastructure point of view -- is just a brand new way of doing things. The central IT team's whole job is to protect the brand of the company and keep the client data safe. They provide the infrastructure necessary for the teams to go out and do what they need to do. The challenge is that the central IT teams are not necessarily set up with the skills to make that happen. They are not by nature software development people. They are hardware people. They are rack and stack people. They are people who understand how to stitch this stuff together -- and they may use some automation. But as a whole it’s never been their core competency. So therein lies the rub: How do you convert these teams over to think in that new way? Gardner: Are we talking about private cloud, public cloud, hybrid cloud, hybrid IT -- all the above when it comes to these trends? Gardner: Just to play the devil’s advocate, when you hear things around serverless, when we see more operations automation, when we see artificial intelligence (AI)Ops use AI and machine learning (ML) -- it does get sort of scary. The challenge we have, Dana, is that once we have established that -- we call that methodology the Minimum Viable Cloud (MVC). And after you put all of that structure, rigor, and security in place -- we still run into the problems of motion and momentum. Those needed governance frameworks are well-established. For an organization that had always fallen back on their big iron or infrastructure -- those processes they had as their competitive advantage -- that now has become a detriment. That’s now the thing that’s slowing them down. It’s the anchor holding them back, and the processes around it. That rigidity of people and process locks them into doing the same thing over and over again. It is a serious obstacle. When it came time to understand what applications were actually running inside the four walls of the data centers -- nobody really knew. As a matter of fact, nobody really knew what applications were talking to what applications, or how much data was being moved back and forth. They were so complex; we would be talking about hundreds, if not thousands, of applications intertwined with themselves, sharing data back and forth. And nobody inside organizations understood which applications were connected to which, how many there were, which ones were important, and how they worked. When it came time to understand what applications were actually running inside of the four walls of the data centers -- no one really knew. Nobody knew what applications were talking to what applications, or how much data was being moved back and forth. Gardner: Virtualizing didn’t solve the larger problem, it just paved the cow paths, gained some efficiency, reduced poor server utilization -- but you still have that spaghetti, you still have those processes that can’t be lifted out. And if you can’t do that, then you are stuck. The company ended up getting a fractured view. We recommended that they go on an education path, to bring the people up to speed on what OpenShift could do for them. Unfortunately, they opted not to do that -- and they are still wrestling with this problem. The best practices that we see today are around allowing the businesses themselves to select the cloud platforms to go deep on, to get good at. ... They want the "dev" from the DevOps process. And we help those central teams to find and govern those services. Then, the business units [have cloud model choice and freedom as long as they] consume those core services -- the access and identity process, the key management services, they encrypt what they are supposed to, and they use the networking functions. They set up separation of the services appropriately, based on standards. And they use automation to keep them safe. Automation prevents them from doing silly things, like leaving unencrypted AWS S3 buckets open to the public Internet, things like that. So what you’re describing, Robert, is a right-sizing for agility, and fostering a separate-but-equal approach. As long as you can abstract to the services level, and as long as you conform to a certain level of compliance for security and governance -- let’s see who can do it better. And let the best approach to cloud computing win, as long as your processes end up in the right governance mix. These are really powerful personal stories that have to be addressed. You have to understand that. You have to understand that the development community now has the power -- they have the power, not the central IT teams. That shift has occurred. That power shift is monumental across the ecosystem. You have to pay attention to that. Whether you’ve just started your SAP HANA journey or have a HANA environment to refresh or expand, you have many infrastructure options to choose from. Know what questions to ask as you evaluate your choices.